Where: First Presbyterian Church, 318 S. Cedar St. in Spokane. Memorials can be made to the Washington State University Foundation, or the WSU School of Agriculture, P.O. Box 641925, Pullman, WA 99164-1925. Eugene A. Prince, a Whitman County wheat farmer who became a voice of moderation in the Republican Party while serving in the state Legislature throughout most of the 1990s, and who paid a political price for his bipartisanship, died Saturday at the age of 77. He collapsed while he and his wife, Patricia, were visiting Sunriver, Ore., said his son, Stephen Prince. Though farming was his vocation, politics was his avocation, Eugene Prince once said. When the harvest was in, the fourth-generation wheat farmer from Thornton, Wash., would travel to Olympia, where he rose from a legislative staff member to state senator over the course of 40 years. His most recent public service was as chairman of the Washington state Liquor Control Board. Along the way he served as president of the Washington Association of Wheat Growers and as a member of the Washington Wheat Commission. Prince was born in Sunset, Wash., on July 31, 1930, to Burdette and Lula Prince. In 1952, he graduated from Washington State University with a degree in agricultural engineering. He served two years as a transportation officer in the U.S. Air Force before returning to the family farm. In 1959, he also began working in Olympia as a bill clerk during the legislative session, rising to assistant chief clerk and committee clerk on redistricting. In 1967, the state House of Representatives elected Prince sergeant at arms, a position in which he served for six years. Prince was elected as a Republican in 1980 to the 9th District House seat, where he immediately crossed party lines on the Higher Education Committee to strip language out of a tuition increase bill to make future tuition hikes automatic. In the House, Prince struck up a lasting friendship with fellow Rep. Gary Locke, a Democrat who later became governor. In 1990, Prince found himself apologizing on the House floor for a remark he made to Whitman County commissioners that Franklin County was in a financial crisis because it had “too many blacks, too many Hispanics and too many drug dealers for the population base,” according to an Associated Press article in The Spokesman-Review. “House members sat silent for a few moments and then one by one, all of the minority members rose to his defense,” the AP reported. He continued to serve 12 years in the House, rising to chairman of the Republican Caucus. In 1992, he called for an end to the “clearly illegal” practice of legislative staff aiding in political campaigns. That year, Prince was elected to the state Senate, where he served on the Transportation and Higher Education committees. After the Republican revolution in the 1994 elections, Prince’s call for his party to take a moderate course fell on deaf ears. In the House, he fought for increased funding for higher education and against regulation of grass field burning. In 1998, as ranking Republican on the Transportation Committee, Prince bucked his party by supporting a gasoline tax increase, opposing a partial-birth abortion ban and supporting a Democratic alternative to the anti-affirmative action Initiative 200. 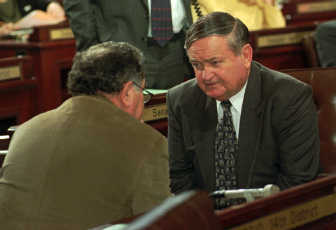 In January 1999, after losing his party’s ranking position on the Transportation Committee, Prince resigned his Senate seat a year before it was to expire and accepted then-Gov. Locke’s appointment to the Liquor Control Board, where he served out his term in 2005. Prince is survived by his wife, Patricia; daughters, Suzanne Davidson, of Pasco, and Pamela Jo Patricio, of Spokane; and sons, Stephen, of Spokane, and John Pfaff, of Tacoma.